There are many different types of solar power generating modules, however mono, poly, thin-film are among the most popular. Each of them has both advantages and disadvantages, however deciding which type of solar cell is most suitable for your personal needs depends on several factors including budget, available space, and environmental factors. Mono-crystalline solar cells are made from a single, very pure silicon crystal, which is grown into an ingot cut into thin slices called “wafers.” These solar cells are among oldest and most dependable ways to produce electricity from the sun. Mono-crystalline solar cells make the most efficient flat solar panels due to their ability to convert the highest amount of solar energy into electricity. Mono-crystalline solar panels are more expensive than polycrystalline due to the complexity of the process required to make them. They have been around a long time, proving their longevity and durability. They are not hazardous to the environment. Polycrystalline solar cells are made by molten silicon poured into a cast. They are made with a mosaic of multiple silicon crystals. Polycrystalline panels are more affordable than mono-crystalline panels due to being easier to make and using multiple silicon cells. Polycrystalline solar cells are less efficient than polycrystalline solar cells. 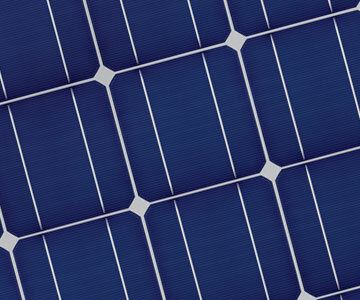 Thin film solar panels are made to be much thinner than mono-crystalline or polycrystalline panels using less silicon. Thin film are generally less expensive. Thin film panels are far less efficient than mono-crystalline and polycrystalline. They can be applied to almost any surface such as metal, glass or plastic. They require nearly twice as much space for the same amount of power. They are flexible and can be bent without breaking. They use Cadmium Telluride, a toxic substance that doesn’t pose a significant risk while on the roof, however they may pose problems at the end of their life-cycle when they need to be disposed. They outperform other panels in high heat. Their performance degrades faster over time. They perform well in indirect light. Amorphous solar panels are the most well developed form of thin film panels. They are formed by vapor-depositing a thin layer of silicon on a material such as metal or glass. They have three layers to capture light from the full spectrum of the sun. Amorphous solar cells are less expensive. They have a shorter lifetime and degrade faster than other types of solar cells. They are more flexible. Amorphous panels are less efficient. Some are made with shade resistant technology or multiple circuits, which allow the panels to continue outputting electricity even if some of the cells are shaded. They have a greater resistance to heat. Building Integrated (BIPV) are photovoltaic cells that replace conventional building materials such as the roof shingles, skylights, or facades. Polycrystalline solar cells are made by molten silicon poured into a cast. They can be made translucent allowing light to transmit through making them suitable for windows and skylights.